The only thing hotter than the sultry temperatures of the Bahamas on Tuesday afternoon was the sizzling perimeter shooting on display from Syracuse at the Battle 4 Atlantis. The Orange drilled 7-of-9 three-point shots in the game’s opening 13 minutes en route to defeating Charlotte, 83-70, in the opening contest of the tournament on Paradise Island of the Bahamas. SU (4-0) would hit 14 triples in the game, one shy of matching the school record, as they cruised to the victory over the 49ers (1-3). The Syracuse defense was almost as good as their long-range bombing, holding Charlotte to a meager 38.0 percent shooting effort, including a 5-of-19 (26.3 percent) mark from beyond the arc. The Orange were directly responsible for a lot of those misses by blocking a dozen shots in the game. The sizzling SU perimeter shooting started early. After Charlotte grabbed their lone lead of the day at 3-2, the Orange ripped off 17 straight points in a span of less than five minutes. Trevor Cooney had his fingerprints all over the run, starting the burst when he fed DaJuan Coleman for a transition bucket. Michael Gbinije hit the first three of the day from deep on the right wing. Cooney zipped a crosscourt pass to Malachi Richardson for a three from the left wing, then hit a triple of his own from the top of the key. Later, Cooney finished the assault with another three, splashing a shot from the right corner on an inbounds play. The run complete, Syracuse led, 19-3, just over six-and-a-half minutes into the game. 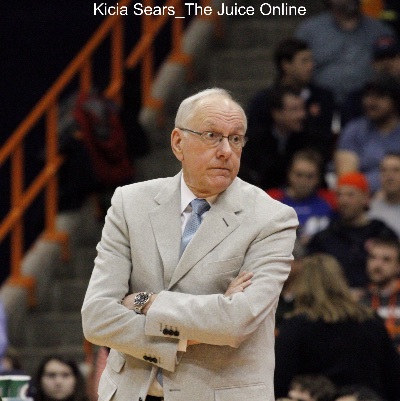 The Orange would maintain a strong lead of between 11 and 17 points for the next eight minutes. They would also very quickly pile onto that lead late in the opening half. With SU holding a 35-22 lead, the quick attacking offense jumped into action again, started by Cooney’s nifty reverse lay-up. Gbinije blocked a 49er shot and started a fast break that ended with Cooney passing to Tyler Lydon for a three-point-play. Cooney finished the 42-second burst with a jumper off an inbounds play to make it seven straight Syracuse points and a 20-point Orange lead with just over four minutes on the clock. Charlotte clipped three points off the margin, but the SU backcourt got back into action. Gbinije tapped home a Coleman miss, then buried a three-pointer. 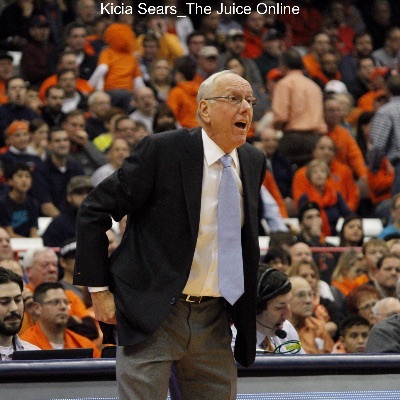 Cooney splashed a transition three and Syracuse held a 50-25 lead with just seconds left in the opening half. The 49ers, however, got a pair of foul shots and went to half trailing by 23. Those free throws were a sign of what was to come in the second half, as Charlotte scored the first ten points of the second half. That opening salvo trimmed the Orange lead down to 50-37 with just over two-and-a-half minutes off the clock. Richardson hit a three to snap the run, but the 49ers would erase a little more off the gap, closing within 55-44. SU responded with a 13-2 run to blow the game back open. Gbinije posted up for an easy basket, then found Lydon behind the defense for a fast break lay-in. 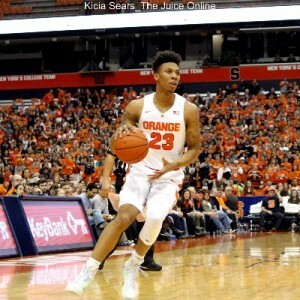 Lydon splashed a three following a 49er score, then Gbinije and Richardson each added treys of their own to give Syracuse a 68-46 cushion as the midpoint of the second half loomed. That margin remained over 20 points until Charlotte ran up nine straight points to pull within 15 points at 76-61 with 5:18 to play. Gbinije buried a three-pointer to stop the bleeding, but the 49ers ripped that bandage right off. Charlotte tacked on nine more points, but they still faced an uphill climb at 79-70 with just over a minute on the clock. Gbinije zipped a pass over the Charlotte defense to Lydon, who stuffed home the ball, then tacked on a pair of free throws to close the scoring. Michael Gbinije was an efficient and effective scorer, piling up 26 points on 9-of-11 shooting, including ripping the twine on 6-of-8 long range shots. Trevor Cooney hit three triples as he piled up 19 points and handed out a game-high five assists. Tyler Lydon filled the stat sheet with 18 points, eight rebounds, and six blocked shots. Malachi Richardson was the fourth SU player in double digits with 12 points, hitting a trio of treys along the way. Tyler Roberson led the Orange with 11 rebounds, including six on the offensive glass, and DaJuan Coleman had three blocks is his season-high 21 minutes of action. Joseph Uchebo was a load for the 49ers, posting a 16-point, 12-rebound double-double. Braxton Ogbueze had 15 points to aid the Charlotte attack, while Bernard Sullivan added 12 and Andrien White chipped in with ten. SU will hit the hardwood again in the semifinals of the Battle 4 Atlantis on Thanksgiving when they take on the winner of #18 Connecticut and Michigan, who battle late Wednesday night. The game is set for an approximate 3:30pm tip-off and will be televised by ESPN, as well as streamed online at ESPN3.com.